When Santa Cruz resident Craig Hass* left his house last Saturday night, he didn’t know he was going to a riot. He had heard over a police scanner at around 10:30 p.m. that people had torches outside of Caffé Pergolesi, but decided that he wanted to see for himself. “I was out of the house in five minutes,” Hass said in a phone interview. Hass, who later helped police identify one of the two men arrested for vandalism, explained his thought process prior to the incident. “I was thinking … who are these guys who think they can set something on fire in downtown Santa Cruz?” he said. When Hass arrived on the scene, he said, things had heated up and although nothing had caught fire, torches and flares were present. “I was shocked at first, and then I was mad to see that they had open flames,” he said. 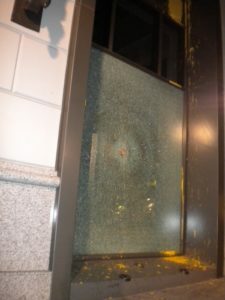 The May 1 riot — the first in Santa Cruz since 1994 — began when participants threw jugs of paint at police cars and tagged anarchist symbols and anti-capitalist phrases onto buildings at around 10:30 p.m. Things escalated when a group of approximately 10 people began smashing storefront windows at approximately 11:05 p.m.
By the time riot officers from the Santa Cruz Police Department (SCPD) and neighboring agencies arrived, 18 businesses had been damaged at a total estimated cost of $100,000. Emily Bernard, a manager at Dell Williams Jewelers, was shocked by the event. 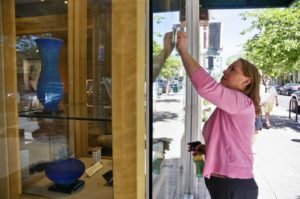 “It was so dramatic, because it was two huge windows that were shattered, and boulders that flew 30 feet into the store,” she said. Dell Williams Jewelers sustained $10,000 to $20,000 worth of damage Saturday night. Bernard laments the night’s events. “It’s a sick feeling to think that people can destroy with such a senseless manner,” she said. 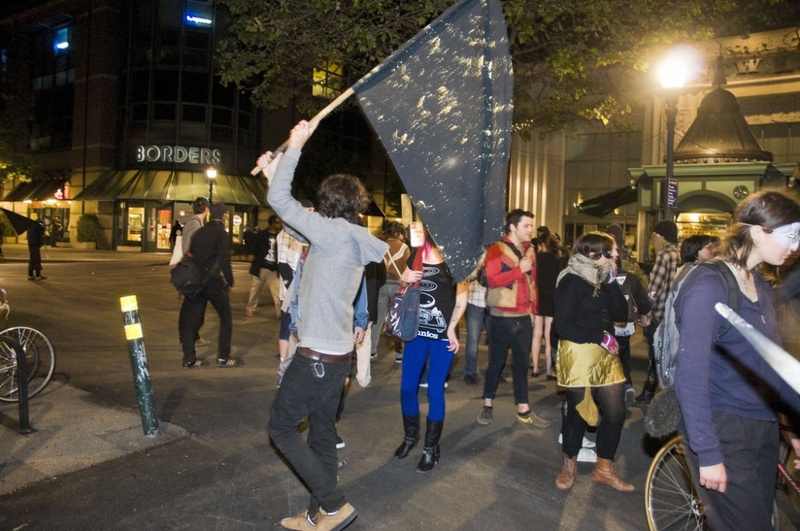 Prior to the riot breaking out, a May Day dance party was held below the clock tower on the corner of Pacific and Water. May Day is an annual event, celebrated across the nation to raise awareness about immigration and labor issues. According to Zach Friend, public information officer for the SCPD, the police department is working with the FBI to identify the individuals involved with the riot. “We’re not painting a broad brush and saying that everyone who was involved in the unsanctioned event was also involved in the vandalism,” Friend said. Friend said that organizers of the dance party had an opportunity to have police presence at a permitted event but elected not to. At 11:23 p.m., over 45 minutes after riot behavior began, law enforcement from around the county arrived on the scene and formed a cohesive group in order to disperse the crowd. Friend attributes the delayed response time to phony 911 calls, which diverted the eight officers who were on duty that evening away from the riot. He also added that there was an officer present when the crowd began to get out of hand, but that the officer pulled back due to safety concerns when protestors began pelting the police car with rocks, bottles and cans of paint. Dell Williams Jewelers’ manager Emily Bernard said that she does not place any blame on the police for arriving after her business had sustained damages. “Whatever the response time was, it’s not like it was Halloween or New Year’s Eve. They had no reason to be prepared for something like this,” Bernard said. UC Santa Cruz third-year Roy Valdez was eating at Acapulco restaurant on Saturday night when he witnessed a large crowd marching down Pacific Avenue with torches and flares. Jessica Meyer, a UCSC first-year from College Nine, was shopping at CVS at around 11 p.m. on Saturday when the store was evacuated by police. 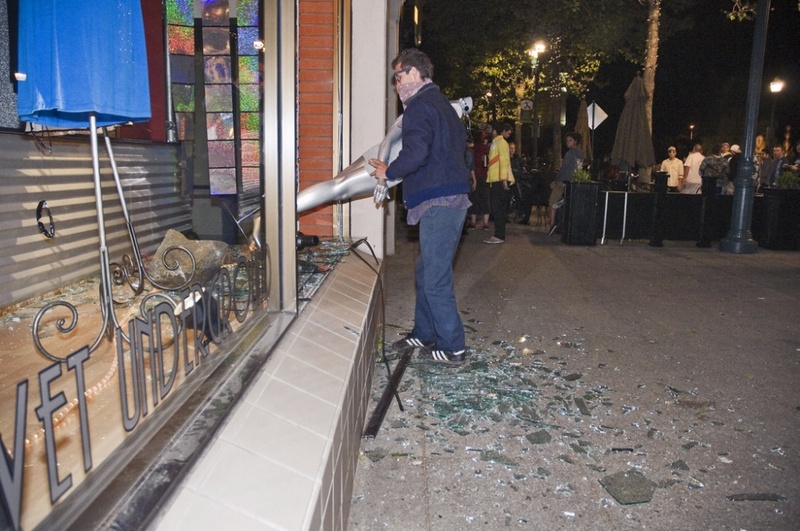 Meyer is concerned that many Santa Cruz citizens may automatically assume that UCSC students were involved in the riot. “I feel really bad for the store owners who have had their stores damaged,” Meyer added. While the police department has not publicly verified individuals or groups that are involved except the two transients arrested (see Police Blotter for more information), it is investigating the group of vandals as a possible anarchist organization. 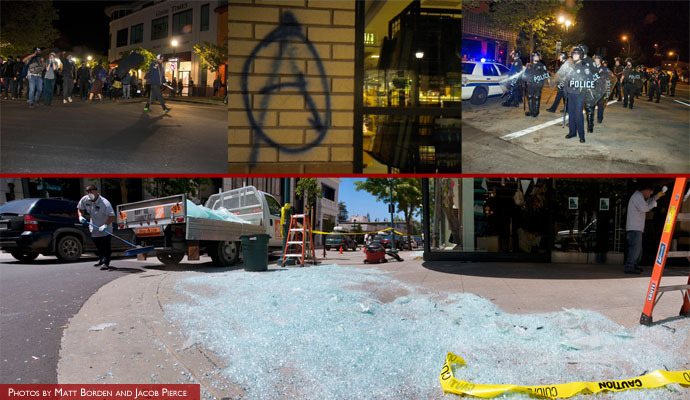 Business owners and Santa Cruz community members alike are focusing their blame on SubRosa, an anarchist café, partly because one of the men arrested admitted picking up fliers for the event there. “We can’t let [an] anarchist café exist now that we know the potential of what they can do and publicize,” Bernard said. SCPD spokesperson Friend said that the investigation will continue to progress with the help of the FBI. The morning after the riot, Analicia Cube, a co-founder of Take Back Santa Cruz, spoke about the conversations she had with Santa Cruz residents. Take Back Santa Cruz is an organization that works to protect the well-being of Santa Cruzans.